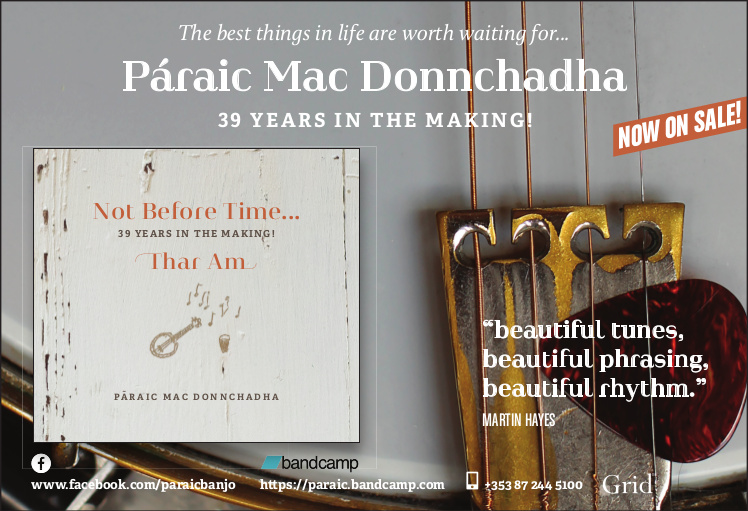 Now playing banjo for well over thirty years, Páraic Banjo Mac Donnchadha has resisted until now the idea of making a personal CD. His resistance to this notion, based on the question in his mind ‘Does the world really need another Banjo CD?’ has finally been overcome by his sense of obligation to those Giants of the tradition, from whom he was lucky to learn, be mentored by and play with since the outset of his musical career. Truly legendary icons of Irish traditional music such as Paddy Carty, Paddy Fahey, Conor Tully and Paddy Kelly, Paddy Canny, Pa Joe Hayes and more have all played a significant role in shaping Páraic’s sense of rhythm and ‘East Galway’ style preference and he feels that the time has come to formally share with others the musical insight and wisdom that he himself was fortunate enough to inherit. The Cobblestone is proud, therefore, to host Páraic’s Album Launch Concert on Thursday evening, 6th September with doors opening at 9.00pm. Páraic will be joined at the concert by his playing colleagues Claire Egan (Fiddle/Viola), Graham Guerin (accordion), Cormac Begley (Concertinas), his brother Mac Dara Mac Donncha (Uilleann pipes), Terence O’Reilly (Guitar), Macdara Ó Faoláin (Bouzouki), Noel O’Grady (Bouzouki), Colm Murphy (Bodhrán), Libby McCrohan (Bouzouki). This is indeed a stellar line-up of talented musicians who have come together to deliver a brilliant musical experience.